People often ask us, does bleach kill mold? While people often try using bleach for mold, it may not be the best solution. There is not a simple yes or no answer to this question, but it is important to know how bleach works when you’re trying to eliminate a mold problem in your home. 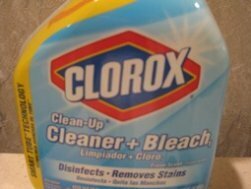 The North Dakota State University recommends using bleach for mold. 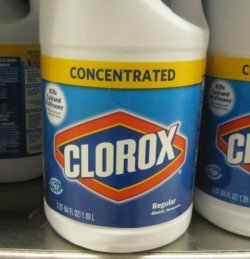 The Clorox Company, a company that makes bleach, says bleach and water will kill some types of mold on hard, non-porous surfaces. They say it will kill Aspergillus niger and Trichophyton mentagrophytes (the mold that causes Athlete’s foot) but don’t say whether or not it will kill any other types of mold. Since there are more than 100 types of mold commonly found growing in American homes, using bleach for mold seems unwise unless you know for certain what type of mold you’re dealing with. You can have a professional come in and test your mold for you if you want to know for sure, or you can use another mold killing agent that is known to be more effective. Both the Occupational Health and Safety Administration (OSHA) and the Environmental Protection Agency (EPA) used to answer the question - does bleach kill mold? - with a “yes” but both agencies have changed their opinions and advice on the matter. They no longer recommend using bleach for mold. Bleach may kill some strains of mold but not others. Bleach is corrosive and many damage some surfaces. In addition, bleach will not penetrate deeply into semi-porous materials like wood, so it will remove mold on the surface but leave traces of mold behind that will just grow back and spread. Water that is in bleach may penetrate deep into the wood which can actually help any mold that is in there to grow. Many products on the market today, advertised to kill mold, contain bleach. They appear to answer the question - does bleach kill mold - with a “yes” but it appears they often based their answer on popular opinion, not science. Despite the advice of the Occupational Health and Safety Administration and the Environmental Protection Agency, many people that have not read their recommendation still mistakenly believe bleach kills just about everything. Companies know that people will feel comfortable using bleach for mold because people won’t realize it’s not the most effective way to get rid of mold. So What Does Kill Mold? Unfortunately, there is not a real simple answer to that question. It depends on what type of mold you have. You can purchase a variety of mold killers at most hardware stores, some of which work better than others, and some of which work for some types of mold but not others. It’s hard to remove all of the mold on some surfaces, such as the wooden studs in your walls. You’re better off cleaning as much of the mold off those surfaces as you can, following up with a strong disinfectant, and then encapsulating. You should also wear protective gear, including a face mask, when cleaning moldy surfaces because inhaling mold spores can make you very ill.
It’s often impossible to kill mold or remove mold from some surfaces, like carpet, drywall and the insulation inside your walls. Even if you kill the mold, if you don’t remove it all from these materials the dead mold spores of some types of mold can still make you sick. These items need to be disposed of and replaced. It should be noted that the EPA recommends calling a professional if you have mold that covers a large area, or if it was caused by contaminated water or sewage. Professionals should know what kills different types of mold and how to handle it safely. A mold removal specialist will know what type of biocide will work best against the strain or stains of mold growing in your home. A mold removal specialist will know what materials in your home can be cleaned and saved and which must be removed and replaced. A mold removal specialist will have any special equipment needed to complete the mold removal job, including safety gear, respirator masks, vacuums with HEPA filters, and negative air machines. A mold removal specialist will know how to handle mold safely and to prevent the spread of mold spores to other areas of your home. You can get plenty of helpful advice by consulting with a mold removal specialist even if you decide to handle the mold removal job yourself. Just follow the link for a list of mold removal contractors offering free consultations in your area.